Are you having an old concrete floor in your home or business and it is no longer having an attractive look? The best thing to do is repairing it and granting giving it a new look. Such a treatment can do great wonders for your home or business. It will completely transform your environment and create a new feeling. Concrete grinding is the process of smoothening down the rough concrete surfaces to reveal a shiny and smooth surface. There are several ways of implementing the concrete grinding project. You can also find many tools of handling this task and the most popular one is the hand-held concrete grinder. Key players in the industry like Palm Beach Concrete Underlayment Services also have advanced tools like grinding cup wheels. The pricing of concrete grinding varies depending on the size of the project and is charged per square foot. The cost also depends on the desired grinding level to make the surface smooth and the other decorative stuff. Concrete grinding is the best way to turn your old and damaged surfaces into a polished and gleaming shiny one. The challenge could be finding a company that you can trust with such a great responsibility. One of the best recommendations for such a company is Palm Beach Concrete Underlayment Services. We have been offering the best concrete grinding services in the region at the best rates. The first thing that you need to look for is whether the company offers references. Its always good to look at the previous work of the company before hiring them. Palm Beach Concrete Underlayment Services has a long list od established clients who are happy with our services. Therefore, you can be sure of getting the best concrete grinding services from our crew. We are proud of our results and hence we will show you some of the previous jobs that we have done in the past. We also have a clear plan on how we approach the concrete grinding job. Our contractors take time to explain to our clients the steps that we will be taking when handling the task. We have a well established process for dealing with ant situation that comes our way. The way we handle your job is very different from the way we handle new concrete. As a brand, we always promise to deliver realistic results. When dealing with concrete grinding, the results depend upon the quality of material that the contractor uses. Our professionals will determine the kind of concrete that you have in your home of business and how we will treat it. Unlike other companies, we are not going to promise what we cannot deliver. We are very honest in our promises and aspire to deliver the best concrete grinding services. The other important thing is to look for a company that uses approved materials and proper equipment. Palm Beach Concrete Underlayment Services has invested a lot in modern technology. Concrete grinding is a highly specialized task and you need to use the right accessories and products to get the best results. The quality of equipment that you use for concrete grinding is a primary determining factor of the quality of the finished product that you will get. Don’t go for a contractor who runs his operations on the side with cheap materials and subpar grinders because you will be getting poor results. 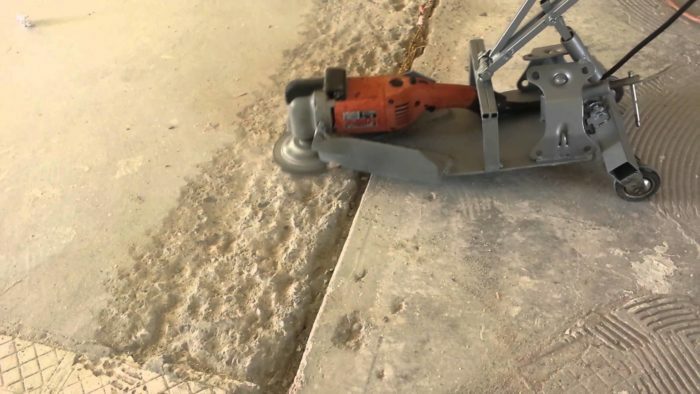 On the other hand, Palm Beach Concrete Underlayment Services has invested heavily in high-end and expensive equipment that help us to produce the best concrete grinding results. The other advantage of our company is that we have the right insurance. Like other projects, grinding down and also polishing a concrete floor carries some level of risk. The company should be able to cover for any unforeseen accidents to your property. Therefore, you will not be liable for any accident that takes place. As a concrete grinding company, we also provide the best warranty in the market. For us, the most important thing is to guarantee you a high level of satisfaction. Therefore, if the results are below what we promised you, you can be able to negotiate for the best corrective action that we can take. Be keen to compare our guarantee period with what the other companies provide. Our polished concrete floors can last you for over ten years before you can begin to see defects. We can also help you in carrying out some minor repairs. At the minimum, we always offer some method of making sure that you obtain high-quality and satisfactory results from us. We have the right team, equipment, and use high quality products to deliver the best results your way.